I recently began visiting Mele Cotte, a blog by a fellow Atlantan named Chris. I was instantly caught by a blog event she’s currently hosting: Cooking to Combat Cancer. With April being Cancer Control Month, it certainly was a fitting time to host such an event. However, let’s be real. Unfortunately, almost everyone I know – including myself – has been touched by cancer in one way or another. My mother was diagnosed with cervical cancer when I was 11. Several friends of mine currently have parents or other loved ones battling the disease. In reality, every month should be Cancer Control Month. While it tends to be unexpected and blindside us when the big C affects someone we care about, there are certain things we can do as preventative measures. One of those things is eating a healthy, balanced diet of fruits & vegetables. Tomatoes are an excellent source of lycopene, which helps battles several forms of cancer. Other foods recommended as cancer-fighting foods are beans & legumes, berries, broccoli, cauliflower, kale, dark leafy greens, garlic (yay! ), onions, chives, grapes, whole grains, and green tea. Who knew that we’ve been eating these foods all along here at Running with Tweezers! – Preheat oven 350. Make a little packet of aluminum foil and set tomatoes in. Drizzle with olive oil and sprinkle with salt and pepper. Seal the foil packet and set in baking safe dish. Bake tomatoes until the skin starts to pucker – for the Amorosa tomatoes, this took about 30-35 minutes. – A few minutes before the tomatoes are ready, lay slices of ciabatta bread on the baking rack to toast. – Remove both the tomatoes and the bread. Shmear each piece of bread with goat cheese and plate. 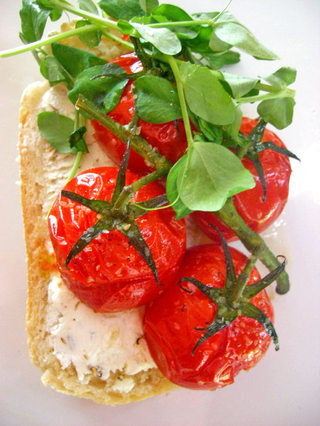 – Place small section of tomatoes on the bread and top with a sprinkle of the greens. Dress with additional olive oil and S&P, if desired. You are so right. Every month should be Fight Against Cancer month. Tami, thanks for participating! I agree – awareness should be continuous. While the walks and all are great, I am always bummed when the publicity fizzles a bit after the 3-day. Every month is cancer awareness? I agree! stunning presentation. the colors are show stopping!